DIY Biking | How bike builds, bike travel and bike life can save the world: Project in the Rearview Mirror! The most miserable, aggravating and preposterous home improvement project I have ever embarked on - the kitchen - is over. People ask to see the 'before' and 'after' pictures of the kitchen. This is my favorite 'during' picture: When demolishing the old kitchen in January I found this under a cabinet that was probably installed twenty years ago - and I've lived in my house for eight. You don't understand middle class disempowerment until you have used four rooms to make one cup of coffee. You don't understand how home improvement gets in your head until you get in bed at night (after doing a task perfectly) and you have a vision that you got something terribly wrong that jerks you awake before you even fall asleep. You also don't understand anger until you want to beat the living daylights out of the person who owned your house in the 1970s because he did not say the following: "No! Don't use staples to attach the subfloor! If a future homeowner wants to redo the kitchen he'll have to pull up hundreds of staples one by one." So as the months slouched on, I had no workshop to speak about. That meant no working on bikes or anything for fun. My Saturdays didn't belong to me. I posted infrequently and was reduced to building a bike time capsule in a dead corner just so I'd have something to write about. But one day, for one project, I got to have the last (and only) laugh. Here's what happened: I wanted a small TV for the kitchen but as I quickly learned, not everybody has the same definition of small. I wanted something smaller than an iPad that I could watch the news while making dinner. But Best Circuit, City Buy, and similar retail establishments only told me a 19" TV was all they could sell me. But finally, after weeks of searching, I found a 7" RCA at the Bull's Head Radio Shack that would fit in the tiny space underneath one of the upper cabinets. Unfortunately, I didn't have a good way to get it to stay there. Wall mount TV units are too big and too heavy, and even if they weren't the TV wasn't made to be mounted under a cabinet. Until I stepped over the trim pieces and toekicks littering my shop one day and came across this. This is a bike rearview mirror; I think it is from Bell but there are a few companies that make similar models. I've always been a fan of the Third Eye helmet mounted rearview mirrors and never had a use for the handlebar ones. I must have taken this one off a bike and never gotten rid of it. I figured out what to do: I broke the unused mirror (being pack-rattish and non-superstitious is a good combination) and carefully centered it on the back of the TV, where I drilled two holes in the weedy plastic desk stand so I could insert a couple of small bolts. I put the now mirrorless mirror on the two bolts and used two pairs of pliers to tighten the bolts. It couldn't hold much more than the weight of the little TV, I know, but all they needed to do was hold the weight of the little TV. Then I brought it upstairs and carefully drilled a small hole in the underside of the little shelf I made under one of the cabinets that would hold the cable box. I inserted the end of the rearview mirror that usually attaches to the handlebars and awkwardly inserted and tightened the bolt. I took my hand away and the TV didn't fall. But it did swivel back and forth, which is what you want when you are mounting a TV in this kind of space. 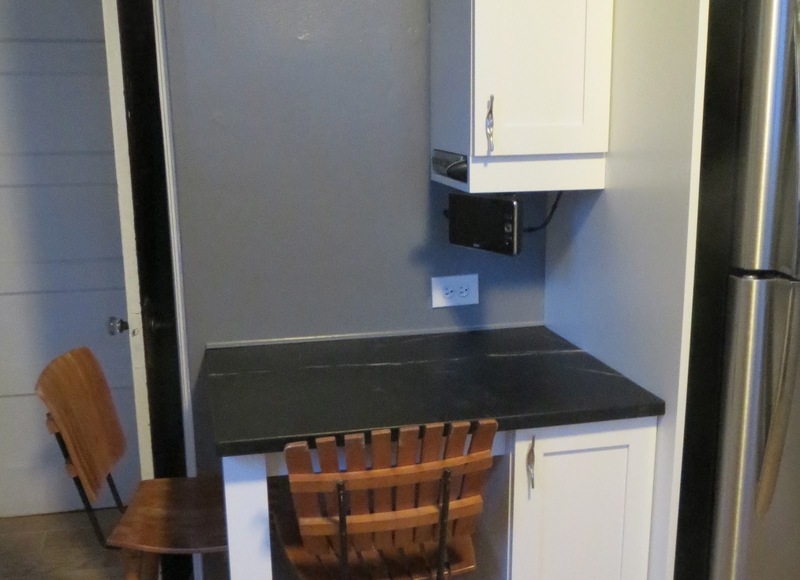 If a person sits alone in the mini breakfast nook (the exact spot where mouse skeleton 1 of 2 was found) it doesn't matter what stool they are sitting in since they can move the TV to the left or the right. And I can point it straight back so I can see it while I'm standing at the stove. For months, I had wanted to put the kitchen project in the rearview mirror, but instead I put a rearview mirror in the kitchen. And the best part is nobody will even notice it unless I tell them it's there. Now I can weld, saw up the few old bike frames I collected over the winter, and fix bikes (the Peugeot I'm using for the National Bike Month Challenge hasn't been back to the shop since I fixed it, but there is 34.7 miles of 112.0 on it so far - and since the Metro North train collision promises to put more cars on the road I'll probably use it even more this week than I thought. Thanks for reading and thanks for riding.